In the weeks since Hawaii's Kilauea volcano began erupting, dozens of homes have burned from oozing lava, people have fled their homes and plumes of steam from the summit have shot skyward, prompting officials to distribute face masks to protect against ash particles. Lava flows have grown more vigorous in recent days and there's concern more homes may burn and more evacuations may be ordered. Still, scientists can't say whether lava flows from nearly two dozen fissures will continue to advance, or stop. "We have no way of knowing whether this is really the beginning or toward the end of this eruption," said Tom Shea, a volcanologist at the University of Hawaii. "We're kind of all right now in this world of uncertainty." In addition to ash fallout from explosions and the threat of lava crossing main highways, officials warned of another hazard Saturday as a flow advanced southeast to the ocean: Laze. "Laze is when hot lava hits the ocean sending hydrochloric acid and steam with fine glass particles in the air," the Hawaii County Civil Defense agency said in an update to the public. The area affected by lava and ash is small compared to the Big Island, which is about 4,000 square miles (10,360 square kilometers). Most of the island and the rest of the Hawaiian chain is unaffected by the volcanic activity on Kilauea. State and local officials have been reminding tourists that flights in and out of the entire state, including the Big Island, have not been impacted. Even on the Big Island, most tourist activities are still available and businesses are open. A handful of people were trapped when a flow crossed a road Friday. Some had to be airlifted to safety. "They shouldn't be in that area," said County Managing Director Wil Okabe. Lava flows have become faster as fresher magma mixed with decades-old magma. The change is attributed to new magma mixing with 1955-era magma in the ground, creating hotter and more fluid flows, scientists said. By Saturday morning, two of 22 fissures had merged, creating a wide flow advancing at rates of up to 300 yards (274 meters) per hour. 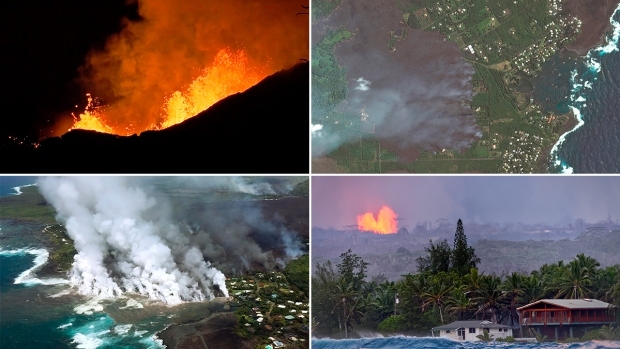 Aerial footage from the USGS showed fast-moving lava advancing to the southeast. The flow was 1.5 miles (2.4 kilometers) from the ocean, scientists said. In the background, the footage showed lava fountaining 328 feet (100 meters) high at one of the fissures. The fountains are created by vents closing, forcing magma to burst through a single outpoint, Stovall said. Civil Defense Administrator Talmadge Magno said a man suffered a "serious" leg injury Saturday when he was hit with a lava spatter while sitting on his porch near the Lanipuna Garden subdivision, the Star-Advertiser reported. Edwin Montoya, who lives with his daughter on her farm near the site where lava crossed the road and cut off access, said the fissure opened and grew quickly. "It was just a little crack in the ground, with a little lava coming out," he said. "Now it's a big crater that opened up where the small little crack in the ground was." The Big Island volcano released a small explosion at its summit just before midnight Friday, sending an ash cloud 10,000 feet (3,048 meters) into the sky. The USGS's Hawaiian Volcano Observatory said eruptions that create even minor amounts of ashfall could occur at any time. This follows the more explosive eruption Thursday, which emitted ash and rocks thousands of feet into the sky. No one was injured and there were no reports of damaged property. It came two weeks after the volcano began sending lava flows into neighborhoods 25 miles (40 kilometers) to the east of the summit. Associated Press journalists Jae Hong, Marco Garcia, Sophia Yan, Audrey McAvoy, Becky Bohrer, Seth Borenstein, and Alina Hartounian contributed to this report.